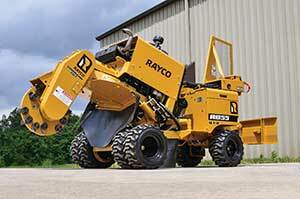 Rayco Manufacturing introduced two stump cutter models—the RG55 and RG80—and the TRG stump cutter trailer. The new items represent the first new product introductions for Rayco since the company was acquired by Morbark in November 2017. An update to the RG45 stump cutter, the RG55 features a 53.4-hp Kubota gasoline engine, for an increase of 9 hp with a power curve on par with or higher than diesel models, according to the company. It provides increased travel speeds and complies with California Air Resources Board and EPA regulations in all 50 states, Rayco said. It also includes large cutting dimensions, wide flotation tires, 4WD, a wide hydraulic backfill blade and a swing-out control station. For travel-through gates, the control station swings in line. The RG80 Stump Cutter includes a 85-hp Ford engine and a hydrostatic cutter wheel drive. Built to replace the RG70, the RG80 has a high power to weight ratio, low ground pressure and a low center of gravity for increased stability, Rayco said. Four-wheel drive signifies no wheel slip, and the propel system features high and low travel speeds, plus an integrated creep mode for precise handling while cutting. It also includes a Magnetek wireless remote control feature that’s sealed against dust, water and other elements and that’s made to withstand shock. Both stump cutter models are available with the Rayco TRG trailer, which replaces the TRSJRW, TRSJRWB and TR100 trailers. It can hold all Rayco stump cutters up to the RG80 and features a heavier axle and wider platform, as well as a TorFlex suspension and electric brakes. The stump cutters are held to the trailer with simple and secure pins, eliminating chains and straps.